This somewhat last-minute birding trip to Japan was spurred by an announced change in my work schedule, one that would make taking long trips a bit more logistically difficult. Eager to sneak in one more trip before the change, Japan in February seemed the logical choice. Dave Provencher and Julian Hough were enthusiastically on board with this idea, and the three of us began planning in November, just three months from departure. This trip would promise quality birds, photographic opportunities, and a unique cultural experience. None of us had visited Japan before. We decided to hit what seem to be the top 3 Japanese birding islands at this time of year, which are, from south to north: Kyushu, Honshu (Tokyo), and Hokkaido. Okinawa is also quite popular, but we did not have time for that. As most international flights from the US go through Tokyo, we began and ended our trip on Honshu. In short, we went from Honshu to Kyushu to Hokkaido and back to Honshu. A winter birding trip to Japan won't net you a large trip list, but you will see several highly sought-after species. On Kyushu you will find a crane spectacle involving 4+ species, fantastic gull variety, and nice diversity of wintering East Asian passerines. 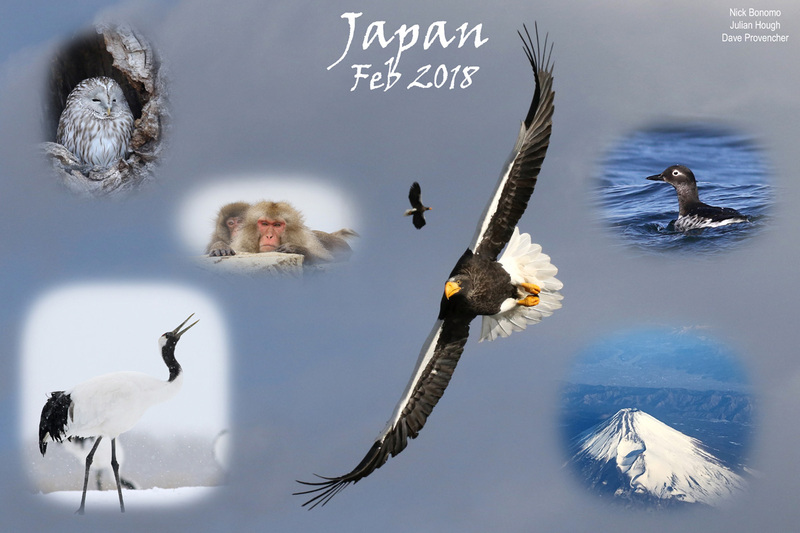 Honshu will give you the opportunity to see three species of albatross via ferry and hang with Japanese Macaques ("Snow Monkeys") in the Japanese Alps. On frigid Hokkaido you will be treated to dozens of Steller's Sea-Eagles, one of the rarest and coolest owls in the world, and 6+ species of alcid. In this space I will post a summary of the birding with photos. We are going to post a much more comprehensive trip report, with plenty of logistical and planning information, to Cloudbirders.